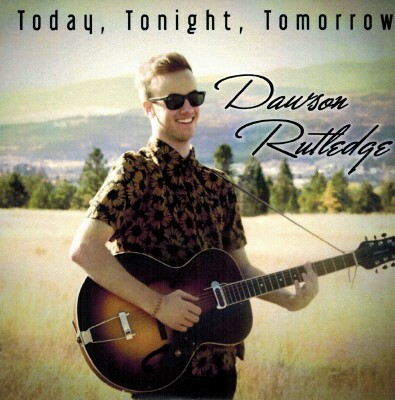 Dawson Rutledge is an 18 year old solo singer/songwriter, musician and performer from Cranbrook, B.C. In 2015, he was awarded the top male musician scholarship by his high school and a District/Authority Scholarship by the Minister of Education for his exceptional ability. Since June 2015 he has been busy performing, writing and recording and now releasing a self-produced album of original songs, with another album in the works. His writings demonstrates themes of love, adventure, the inevitability of time and important worldy issues. His style of performing is very unique and extremely entertaining. He plays acoustic and electric guitars and accompanies himself by playing a kick-drum and a tambourine with his feet. Dawson's style has been compared to that of artist Shakey Graves and his vocals compared to singer/songwriter David Gray. He has a powerful and captivating stage presence which had developed from many years of musical training, lessons, and acting in musicals. His music is available to download/purchase on itunes and bandcamp. Atlantic Seabreeze gives this abum very good ratings and forsees a very bright future with his musical career. For more information regarding Dawson and his music, go to his above facebook address.